Vitamins & MineralsFOURPLUS 4+ Vita+ - 60 tabl. FOURPLUS 4+ Vita+ - 60 tabl. High-quality dietary supplement based on natural vitamins and minerals. Specially prepared for athletes of vitamins and minerals. 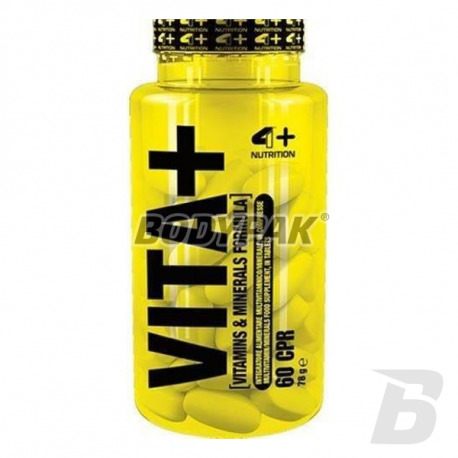 CREATED IN RESPONSE TO DEMAND AMONG THE ORGANISM IN VITAMINS HARD TRAINING ATHLETES. 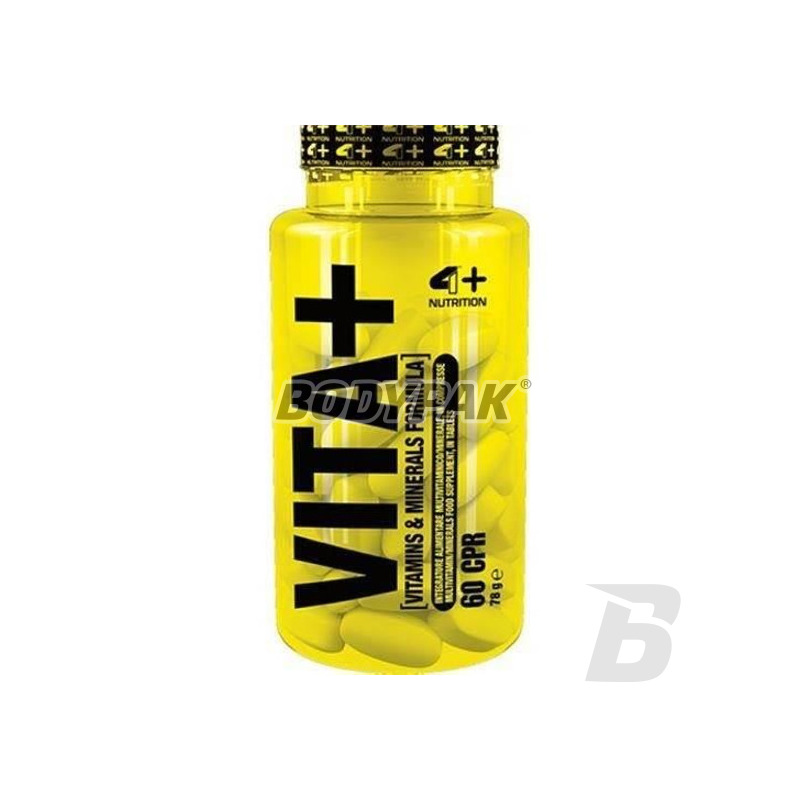 4+ Vita + was created in response to the demand of the body in vitamins among hard training athletes. Intense physical training increases the demand for nutrients, including vitamins, minerals, and a number of physiologically active substances that should be supplied with the diet. HIGH QUALITY FORMS OF VITAMIN AND MINERALS. Unfortunately, in most cases, provide such large quantities of nutrients is often very difficult during periods of intense training. In such cases, it points to the need supplementation with nutrients high quality with a high degree of bioavailability. It contains all the necessary trace elements to maintain optimal body functions. Składniki: substancja wypełniająca (celuloza mikrokrystaliczna), dwufazowy fosforan wapnia, tlenek magnezu, witamina C (kwas askorbinowy), witamina E (octan tokoferylu), glukonian żelaza, glukonian cynku, witamina B3 (nikotynamid), witamina B5 (pantotenian wapnia), witamina B3 (Nicotinamide), glukonian manganu, witamina B6 (chlorowodorek pirydoksyny), witamina B1 (chlorowodorek tiaminy), substancje przeciwzbrylające (sole magnezowe kwasów tłuszczowych, dwutlenek krzemu), witamina B2 (ryboflawina), glukonian miedzi, witamina D3 (cholekalcyferol), witamina A (octan retinylu), witamina K2 (phytomenadione), piklonian chromu, witamina B9 (kwas foliowy), witamina H (biotyna), jodek potasu, witamin B12 (cyjanokobalamina). Magnesium with vitamin B6 in the form of tablets. High-quality chemical forms guaranteeing an adequate bioavailability! Easy-to-swallow tablets.